“John Tzetzes, that most unpleasant man, pretended to wider reading than he possessed and was a complete failure as a critic; but he had some advantages that we have not. The three princes of the church, Eustathius of Thessalonica, Michael Choniates of Athens and Gregory of Corinth (c. 1200), rank much higher. From Acominatus we learn that, apart from the Acropolis, the ancient monuments of Athens were already in his day as ruined, and her ancient traditions as forgotten, as when exploration began in the seventeenth century. 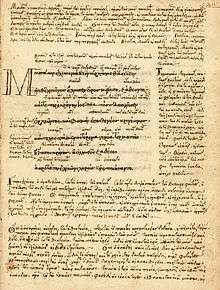 The amount of material on Homer amassed by Eustathius is astounding, and his commentary, one of the first printed books, dominated Homeric studies for years; we possess it in the author’s own hand. At home it would not have found a public, even if the disastrous Fourth Crusade had not brought about a general decline and made havoc of the still ample heritage of ancient literature.